As the weather begins to warm up, I find myself fantasizing about all the delicious spring and summer Weight Watchers Recipes I’ll make this year. And of course, to go with all of these fabulous dishes, I’ll be indulging in some fantastically fresh and light drinks. 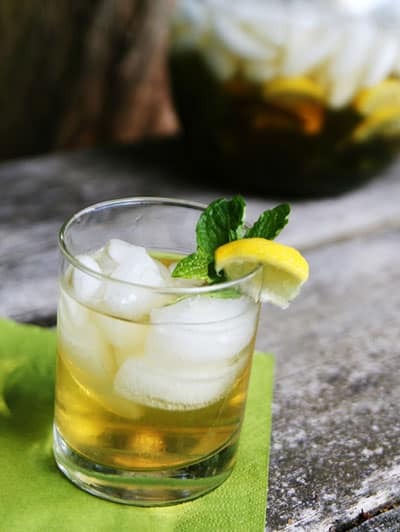 One of my all time favorite spring/summer drink recipes is this light and refreshing Jasmine Iced Green Tea Recipe with Mint and Lemon. Though it seems pretty simple, it’s lively flavor makes a big impact. I love serving this during the spring with a light lunch or with a hot summer’s night dinner. It’s also a great, healthy party drink recipe for just about any celebration! It’s a much healthier option than guzzling down tons of diet soda. A cold and delicious summer drink recipe that offers a refreshing way to cool down. Floral jasmine green tea, heightened with fresh mint and lemon. Steep loose tea (or tea bags) and mint leaves in 4 cups of simmering (not boiling) water for 2 to 3 minutes. Strain the tea (or remove tea bags and mint leaves) and pour into a large pitcher. Stir in lemon juice and cold water, and stir. Refrigerate until chilled, about 2 hours. Serve over ice with mint sprigs, if desired.